Review unit provided by Altech Computers, a distributor with offices in Sydney and Brisbane. 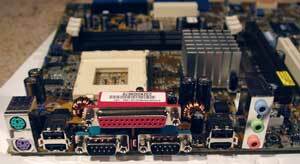 The motherboard market is a huge segment of the PC Hardware industry, with a wide selection of companies offering products - probably second only in number to video card manufacturers. Similarly to the video card market, the actual chipsets that power the products are made by only 2 or 3 companies, with lots of smaller companies producing boards around those chipsets. This makes for a very competitive market - it's difficult for any one company to distinguish its products from any others, when they're all based on the latest and greatest chipset. One obvious way to differentiate is by making your product cheaper than everyone else's, but another way is to bundle a lot of extra stuff with it and hope that consumers see the value of the extra goodies. This is most definitely the approach that Asus favour. They are one of the largest (indeed, for quite some time and perhaps still THE largest) producers of motherboards in terms of product volume. I know that many people will buy Asus products simply for the name and reputation, regardless of Asus rarely being the cheapest. Today we'll be looking at their KT333 offering - for SocketA CPU's and DDR memory - which is absolutely packed to the gills with extra features. In terms of layout, Asus have done pretty well. As is typical from them there are only 3 DDR slots and only 5 PCI slots, but this also seems to be the norm from other manufacturers recently (on the KT266A side, I only recall Abit and EPoX having 4 DDR and 6 PCI). A couple of my standard layout gripes are not present, as the RAM slots are not fouled by a card in the AGP slot and the CPU socket lugs are not flush with the top of the board, which means it won't be too fiddly to change the CPU cooler in a minitower. However, in solving those 2 problems they've introduced another - when using a large cooler like the Alpha 8045 (Thanks CoolPC!) the RAM slots are very nearly fouled and to remove a cooler that uses the socket lugs to mount can require emptying the RAM slots first. ASUS C.O.P. - CPU Overheat Protection: This is a feature we're seeing more often on SocketA boards. When the internal thermal diode in AthlonXP or other Palomino or Morgan cored CPU's reaches a BIOS-adjustable temperature limit, the system powers off. This is to hopefully stop your CPU frying itself if the fan fails or your heatsink is improperly installed etc. POST Reporter: Using the Winbond speech controller, POST warning messages are spoken via the onboard audio or PC speaker. So, instead of just a blank screen or mysterious beeps, a funny robotic voice gives you a hint as to what might be wrong.. RAM fault, missing video card etc. You can record your own messages into the system, too. My Logo: Lets you choose a custom boot logo displayed during POST. This feature has been around for a while - by default the A7V333 displays a nice logo similar to the box artwork (see page 3 of this review). Q-Fan: Intelligently controls fan speed according to temperature. I didn't observe this having any noticeable effect on fan noise while using the board. 6-Channel Audio: The C-Media (CMI) 8738 is onboard. This is noticeably better than the AC97 audio codec more commonly seen onboard. To my non-audiophile ears the sound is very similar quality to an SBLive! USB 2.0: As well as the 2 regular USB 1.0 headers we see on every motherboard now, the A7V333 has VIA's VT6202 USB2.0 controller on-board with 4 ports (2 on motherboard, 2 on extra backplate). This allows for more devices and a faster transmission speed than USB 1.0. 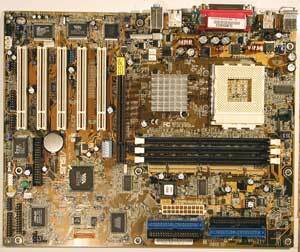 FireWire/IEEE1394: As if there weren't enough plugs on this motherboard already, 2 FireWire ports are offered on an extra backplate. This is a competing standard with USB which has achieved more success on the Apple side than PC's but is used for a lot of digital video cameras, external storage devices etc. ATA-133 RAID: Last but certainly not least, Promise's PDC20276 ATA RAID controller is onboard. This is a RAID0 and RAID1 solution only but the striping and mirroring features seem to be of interest to enthusiasts more and more lately. See here and here for more info about RAID0. The lack of onboard video isn't too surprising - this is clearly a performance enthusiast's board so Asus expect you to buy your own high-performance video card (like their Ti4600 offering) and upgrade when appropriate. I was surprised to find no onboard Ethernet, though. This is a common requirement that Asus could have included without increasing the cost of the board much.